Never being one to pass up on an opportunity to work with innovative food creatives, I’m thrilled to be partnering with Faithful to Nature for today’s epic family feast! As South Africa’s largest online organic shop, FTN’s extensive range of natural and organic products make eating healthy a breeze. With over 11 000 products to choose from, locating your favourite products just got a whole lot simpler. Together with 11 other awesome local bloggers, our #faithfulfood challenge was to create a springtime family-friendly meal that would get a thumbs up for super-healthy and delicious. Scanning the brief, words like easy cooking methods, innovative, vegetarian and seasonal pointed me directly to this menu. The ingredients are readily available and don’t require an expert forager to source. With this in mind, my main objective was to create recipes that are simple, doable and bursting with bright summery flavours. Of all the food related work I do, my cooking classes are possibly the most rewarding. I love the interaction that happens when food is shared around the table. Apparently, some women find mowing the lawn more appealing than getting behind the stove. Lack of inspiration and time constraints are issues that always seem to pop up in conversation. Children are my other favourite people to talk to about food. Never subtle and always honest. Best food? Yip, it’s pasta! No complicated ragu-filled ravioli with burnt butter sage sauce here. Just straight up Italian style, like the basil pesto pasta we’re having tonight. 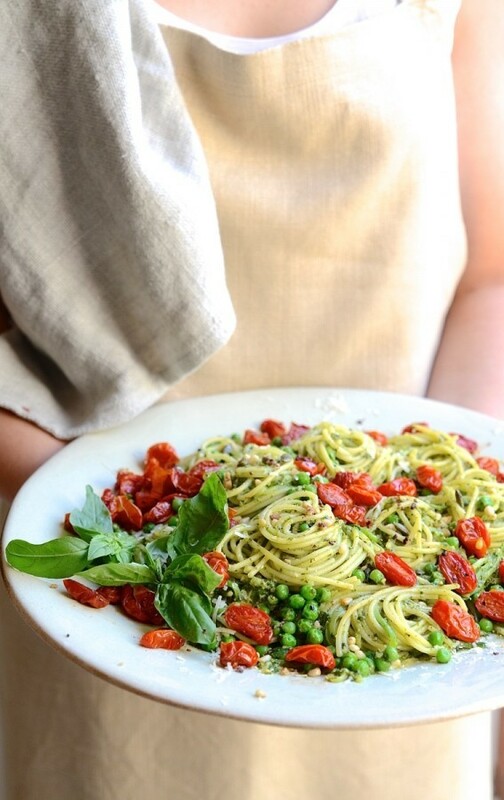 To keep it light and seasonal, we’re adding fresh garden peas, courgette spaghetti and roast cherry tomatoes. This is my go to candied tomato recipe, but fresh tomatoes will also do. This pasta dish lends itself to sneaking in loads of ‘invisible’ veggies that’ll see even fussy eaters lining up for seconds. Together with the greenest pesto, it’s a full 5 of our 5-a-day count. Not bad for a bowl of pasta. For textural crunch, we’re finishing with a dried olive and parmesan nut granola. 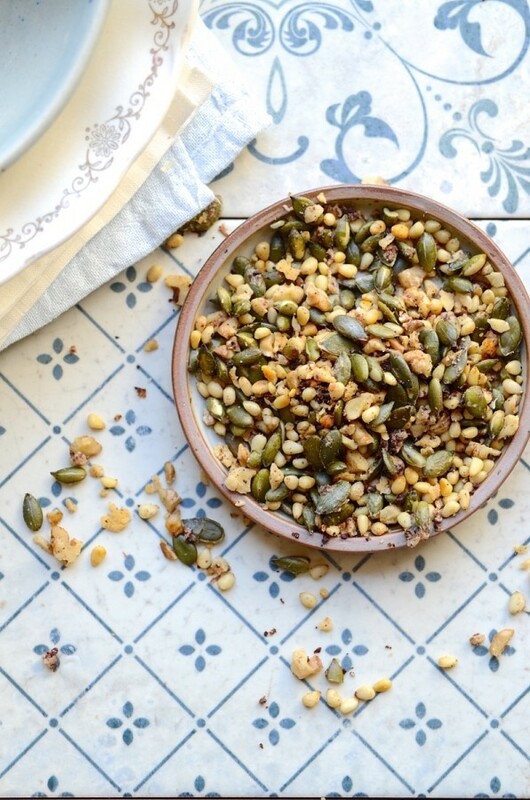 If you’ve never tried savoury granola, it’s totally addictive! Crunchy, salty and so good scattered over your favourite summer salad bowl. For the pasta, I’m using spelt spaghetti from my FTN pantry basket. 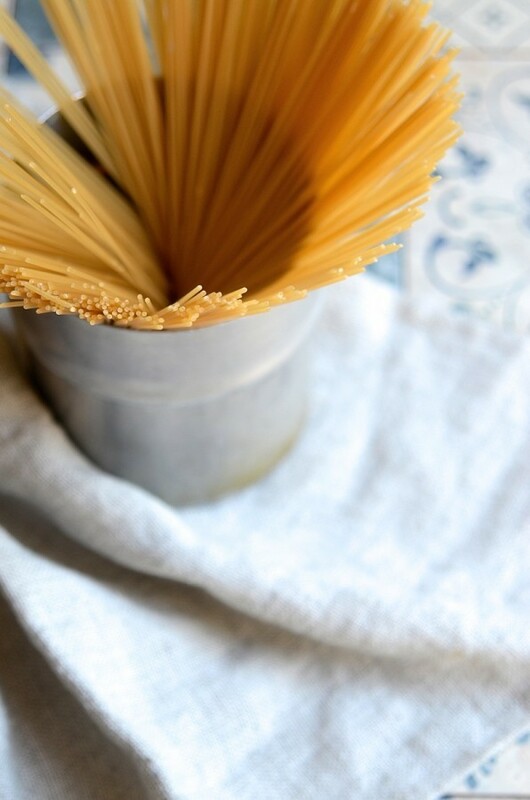 Spelt spaghetti is rich in fibre with a toothsome nutty bite. You can read more about this ancient grain in this spelt hamburger bun post. 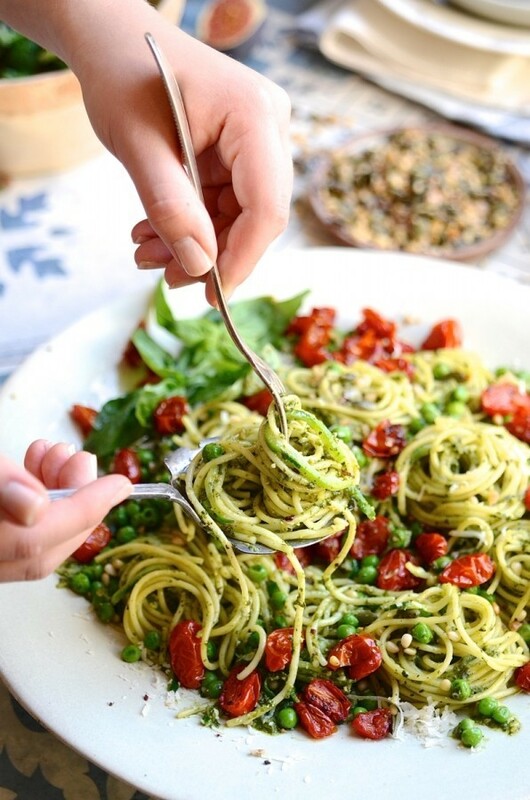 The secret to a great pesto pasta is obviously the pesto. This recipe is easy enough for kids to make and loaded with greens – baby spinach, rocket and heaps of basil. 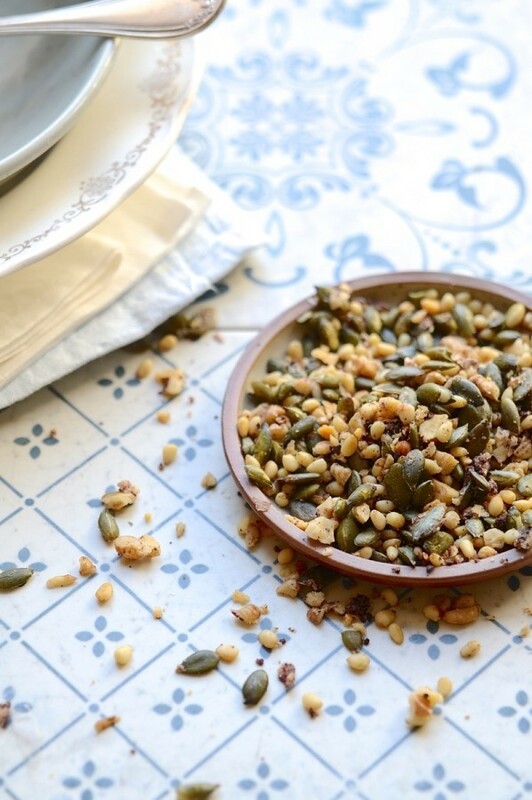 I’m mixing it up with pine nuts, walnuts and pumpkin seeds for maxed-out flavour and nutrient-dense value. Cooking from scratch with unrefined foods that are as close to nature as was originally intended, lessens the toxicity in our bodies and puts us on the path to good health. 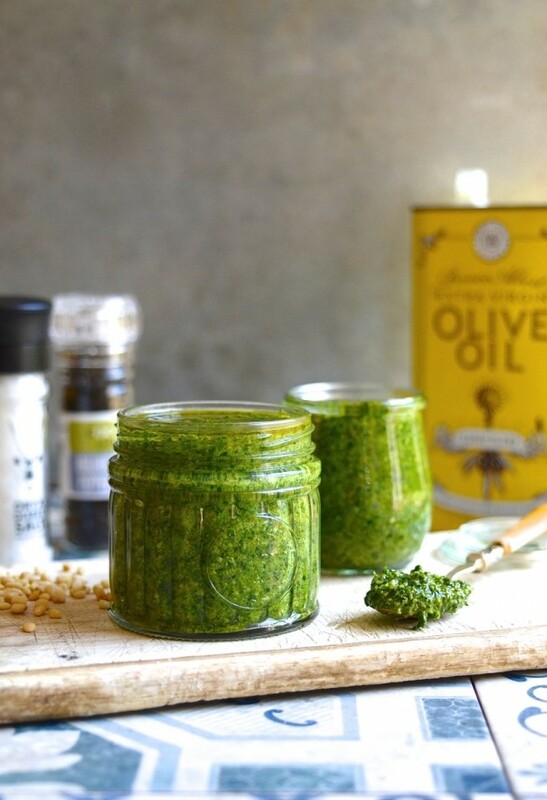 I make a huge batch of this super-green pesto and store it in the fridge for the best rye bread mozzarella cheese toasties or to rustle up a quick after school pasta lunch. In my kitchen a good recipe is one that’s versatile and can be incorporated into a host of other dishes, as is the Italian way. 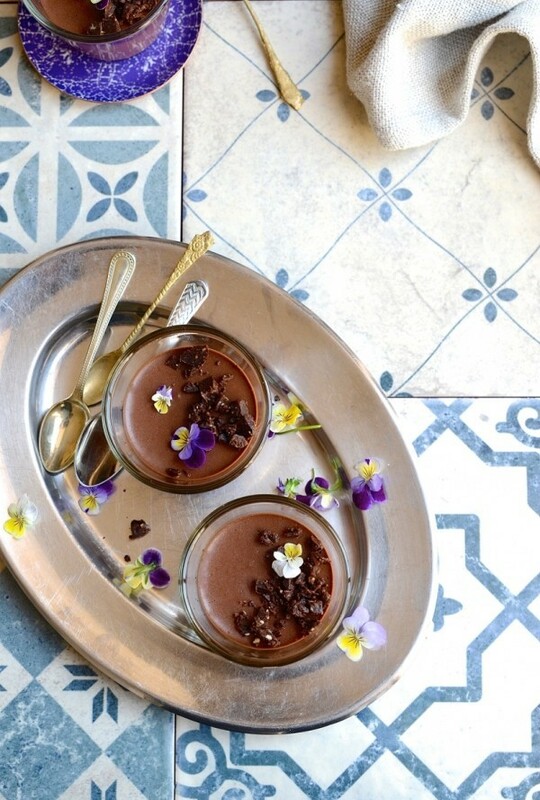 And because no family dinner is quite complete without a little something sweet, these velvety chocolate pots are also on the menu. 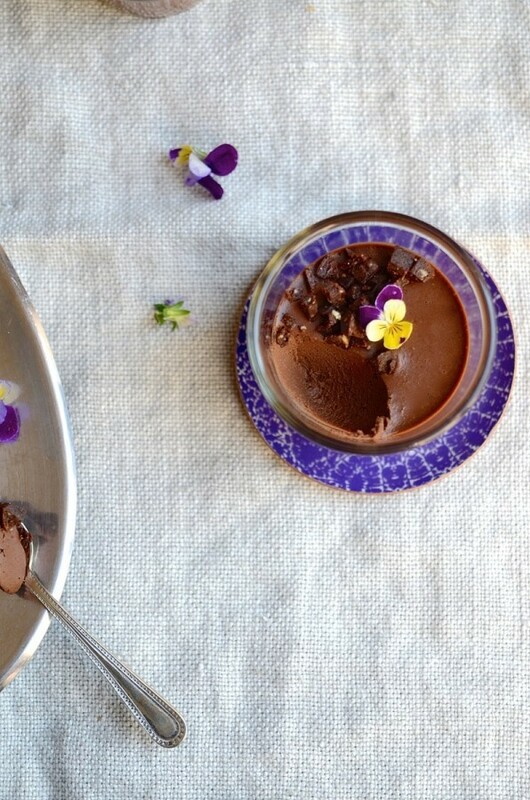 These decadent desserts are packed with antioxidants and good-for-you coconut cream. With only 3 ingredients, it’s hardly a recipe and a nifty little dessert trick to have up your sleeve. 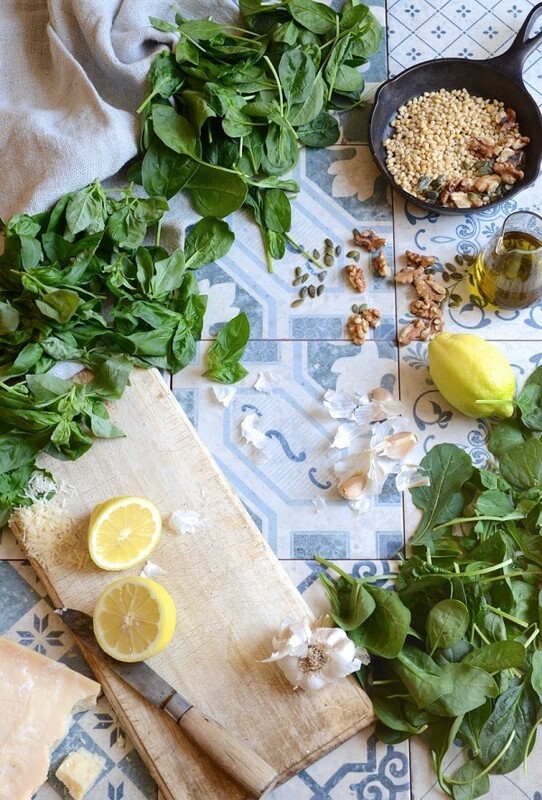 Starting with the pesto, place the spinach, basil, rocket and garlic in a large food processor. Whizz together until fine. You can do this in batches if necessary. Add the lemon zest, juice and all the nuts. Blitz briefly. Add the parmesan and pulse to combine. Pour in the Extra virgin olive oil and season with salt and black pepper. Give the pesto a final brief pulse to incorporate the oil. Store in a sterilised jar and keep refrigerated. Bring a large pot of salted water to the boil. Cook the pasta until al dente. Add the peas and courgetti to the pasta and cook for a 1 minute. Reserve 1 cup of cooking water before draining the pasta. Return the pasta and vegetables to the pot, toss through 3/4 cup of pesto and 3/4 cup of the reserved cooking water to loosen the sauce. Top with the tomatoes and serve with savoury granola and a drizzle of Extra virgin olive oil. To make the granola, heat the olive oil in pan and toast the seeds until golden. Mix through the dried olive crumbs. Season lightly with salt and black pepper. When the granola is cool, add the parmesan and combine. 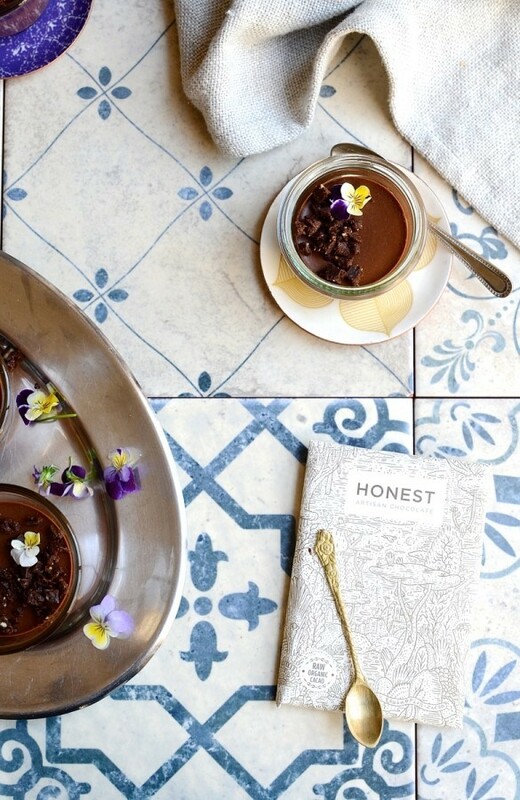 For the chocolate pots, place the chocolate in a bowl. Heat the coconut cream in a separate bowl until hot. Pour the coconut cream over the chocolate and whisk until the chocolate is smooth and melted. Add the honey and combine. Pour into espresso cups and chill for about 2 hours until set. Scatter over the raw chocolate bar pieces and serve. Di, this dish looks absolutely amazing! Sho, this is axactly the stuff that I love to eat! And your pictures are exquisite. Thank you Tandy. 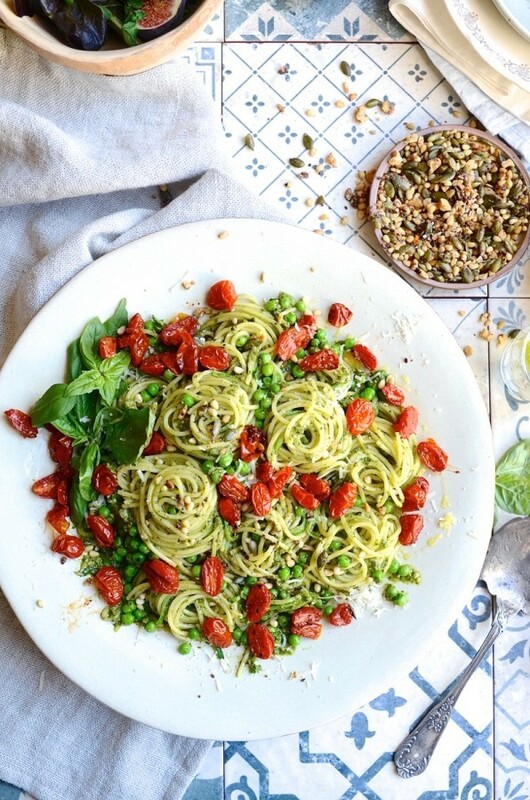 We’re massive pesto fans and if it can hide some extra greens, so much the better! So kind of you Ilze. My girls just love pesto pasta so they weren’t complaining helping out in the ‘test kitchen’. Absolutely stunning!! My kind of meal and so beautifully photographed – love this. With all the incredible FTN recipes, it’s going to be difficult to decide which to make first. This was amazing! Thanks for the recipe Di. Quick and easy, Added some tuna to the leftovers the next day for lunch and it was still good even though it was cold. Fortunately there’s always left over potential with pasta. Love the tuna idea. My girls added chicken, feta and more pine nuts! How many chocolate pots does the recipe make and what size containers did you use? Hi Lindy. 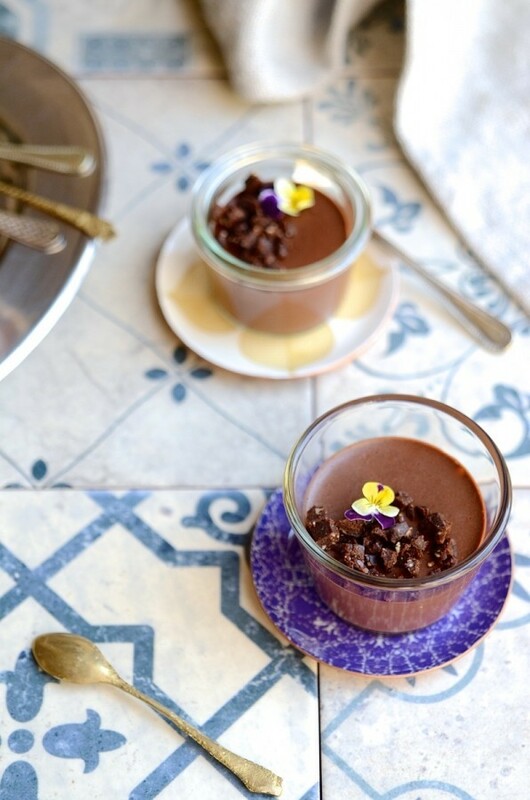 This dessert is quite rich so I like to serve smallish pots. The quantity is enough for four. I use espresso cups or shot glasses – about 50ml portions. 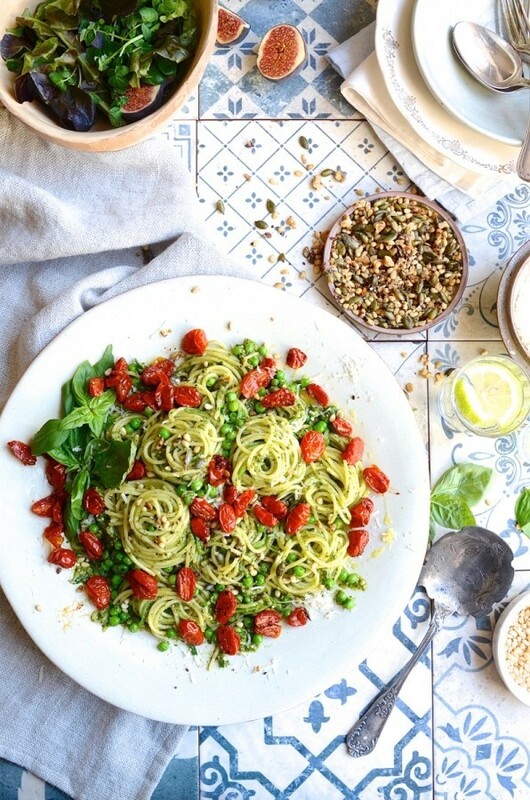 Thank you for this delicious Pesto Pasta Sauce recipe Di. You saved my bacon last night when I forgot to take meat out of the freezer for dinner. This is truly the ULTIMATE PESTO PASTA SAUCE!!! Dinner was ready in no time and so totally scrumptious. 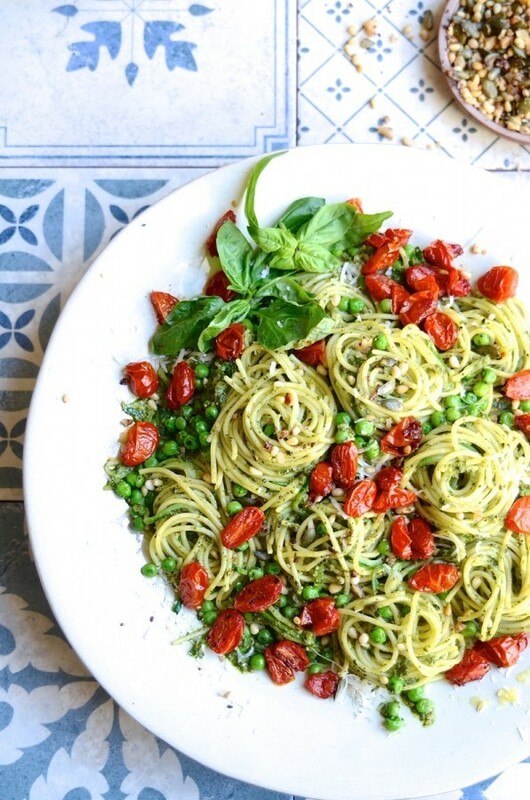 This pesto recipe is on constant repeat in our kitchen. It’s just the handiest quick fix to have on hand. I think we could all do with more last minute meal solutions like this!